Fred Press was an American artist, and from 1950 to the 1980s was the chief designer of Rubel & Co on NY’s Fifth Avenue. He set out to revolutionise giftware, bringing his artistic sensibilities to domestic ware. 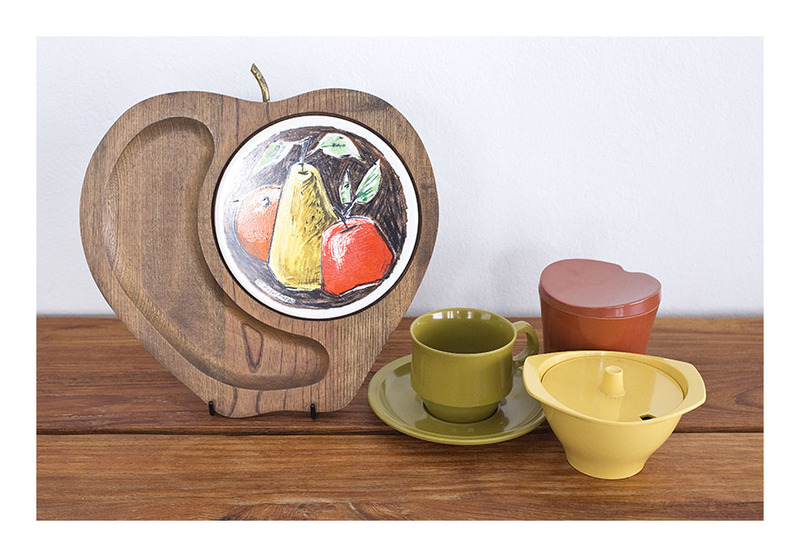 Here we see a cheese/fruit board, in the shape of an apple, with one of his iconic drawings reproduced on the ceramic tile. The tile itself was made in Japan and is set in American teak, and it is signed Fred Press. Lionel Suttie was an Australian industrial designer, bought in to Bessemer to revolutionise the design of utility ware– butter dishes, sugar bowls and table ware. This was the first time mass produced melamine products were thought worthy of design – or that they could make could make a design statement. In this image- a russet brown lidded condiment bowl, an avocado cup and saucer and a yellow sugar bowl. Altogether a fine homage to the 70s and 70s designers.